During one of the Mewġa Mużika workshops. 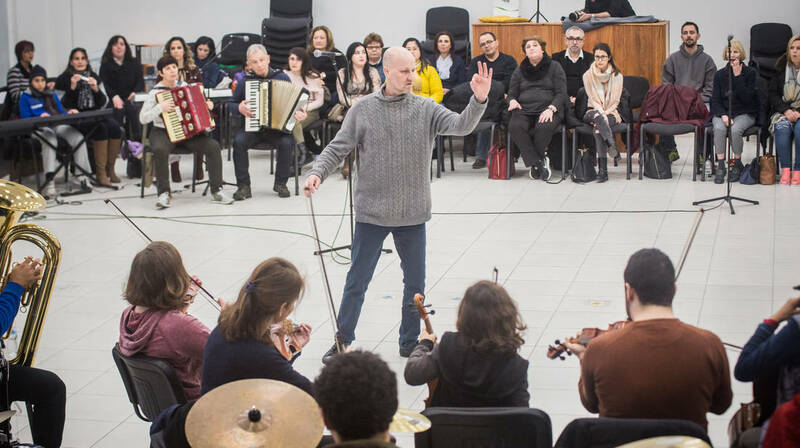 In preparation for a final large-scale collective performance on the 9th of September 2018, various communities are taking part in intensive workshops with Ondamarela maestro, Tim Steiner, to create a big community orchestra. Mewġa Mużika, which is part of the Valletta 2018 Cultural Programme, is an interactive musical work curated by the Portuguese group Ondamarela. Rooted in cooperation and collaboration, it proposes the creation of a public music performance that builds bridges through music. Whether one is an amateur or aspiring musician, a music lover, a trained professional, or has always wanted to play an instrument, everyone is invited to take part in Mewġa Mużika. Interested applicants can sign up by filling in this Google form or by sending a private message requesting more information from the Ondamarela team via Mewġa Mużika’s Facebook page. Workshops for participants (musicians and non-musicians) who wish to take part in this project are currently underway. These workshops have been taking place every month throughout the year 2018 in Malta and Gozo, and are open to people of all ages, experience levels, occupations and musical backgrounds. Absolute beginners are also welcome. The final performance will be on Sunday 9th September at il-Foss, Mdina Ditch Gardens, Mdina. It will be a unique and irreplicable concert that brings together beginners, amateurs and professionals with new music composed and arranged by the communities involved, reflecting their diverse memories, worldview and culture. Mewġa Mużika reinforces the idea that all citizens can have a large-scale impact on artistic initiatives in a structured, rigorous and ludic way, while also creating a platform for local musicians from all genres and walks of life. Video updates related to the project can be viewed on Mewġa Muzika’s Facebook page or at ondamarela’s website. At the end of the process, these short video updates will culminate in a documentary that chronicles the emotional and creative journey undertaken by participants throughout the Valletta 2018 project Mewġa Mużika.